Shupe, M. D., D. D. Turner, V. P. Walden, R. Bennartz, M. Cadeddu, B. Castellani, C. Cox, D. Hudak, M. Kulie, N. Miller, R. R. Neely III, W. Neff, and P. Rowe, 2013: High and Dry: New observations of tropospheric and cloud properties above the Greenland Ice Sheet. Bull. Amer. Meteor. Soc., 94, 169-186. doi:10.1175/BAMS-D-11-00249.1. Miller, N.B., D. D. Turner, R. Bennartz, M. D. Shupe, M. S. Kulie, M. P. Cadeddu, and V.P. Walden, 2013: Surface-based inversions above central Greenland. J. Geophys. Res., 118, 495-506, doi: 10.1029/2012JD018867. Neely III, R. R., M. Hayman, R. Stillwell, J. P. Thayer, R. M. Hardesty, M. O�Neill, M. D. Shupe, and C. Alvarez, 2013: Polarization LIDAR at Summit, Greenland for the detection of cloud phase and particle orientation. J. Atmos. Ocean. Technol., 30, 1635-1655. Neff, W., G. Compo, F. M. Ralph, and M. D. Shupe, 2014: Continental heat anomalies and the extreme melting of the Greenland ice surface in 2013 and 1889. J. Geophys. Res., 119. doi: 10.1002/2014JD021470. Cox, C.J., V.P. Walden, G.P. Compo, P.M. Rowe, M.D. Shupe and K. Steffen: 2014. Downwelling longwave flux over Summit, Greenland, 2010-2012: Analysis of surface observations and evaluation of ERA-Interim using wavelets. J. Geophys. Res., 119, 12317-12337, doi:10.1002/2014JD021975. Castellani, B., M. D. Shupe, D. R. Hudak, and B. E. Sheppard, 2015: The annual cycle of snowfall at Summit, Greenland. J. Geophys. Res. Atmos., 120, 6654-6668, doi:10.1002/2015JD023072. Miller, N. B., M. D. Shupe, C. J. Cox, V. P. Walden, D. D. Turner, and K. Steffen, 2015: Cloud radiative forcing at Summit, Greenland. J. Climate, 28, 6267-6280, doi:10.1175/JCLI-D-15-0076.1. Shupe, M. D., M. Tjernstr�m, and P. O. G. Persson, 2015: Challenge of Arctic clouds and their implications for surface radiation [in "State of the Climate in 2014"], Bull. Amer. Meteor. Soc., 96(7), S130-S131. Cox, C. J., V. P. Walden, P. M. Rowe, and M. D. Shupe, 2015: Humidity trends imply increased sensitivity to clouds in a warming Arctic. Nature Communications, 6:10117, doi:10.1038/ncomms10117. Uttal, T., and Coauthors (including M. D. Shupe), 2016: International Arctic Systems for Observing the Atmosphere (IASOA): An International Polar Year legacy consortium. Bull. Amer. Meteor. Soc., 97, 1033-1056, doi:10.1175/BAMS-D-14-00145.1. Pettersen, C., R. Bennartz, M. S. Kulie, A. J. Merrelli, M. D. Shupe, and D. D. Turner, 2016: Microwave signatures of ice hydrometeors from ground-based observations above Summit, Greenland. Atmos. Chem. Phys., 16, 4743-4756, doi:10.5194/acp-16-4743-2016. Solomon, A., M. D. Shupe, and N. B. Miller, 2017: Cloud-atmospheric boundary layer-surface interactions on the Greenland Ice Sheet during the July 2012 extreme melt event. J. Climate, 30, 3237-3252, 10.1175/JCLI-D-16-0071.1. Miller, N. B., M. D. Shupe, C. J. Cox, D. Noone, and K. Steffen, 2017: The surface energy budget at Summit, Greenland. The Cryosphere, 11, 497-516, doi: 10.5194/tc-2016-206. Lacour, A., H. Chepfer, M. D. Shupe, N. Miller, V. Noel, J. Kay, and D. D. Turner, 2017: Greenland clouds observed by Calipso: comparison with ground-based Summit observations. J. Climate, 30, 6065-6083, doi:10.1175/JCLI-D-16-0552.1. Stillwell, R. A., R. R. Neely III, J. P. Thayer, M. D. Shupe, and D. D. Turner, 2018: Improved cloud phase determination of low level liquid and mixed-phase clouds by enhanced polarimetric lidar. Atmos. Meas. Tech., 11, 835-859, doi:10.5194/amt-11-835-2018. Pettersen, C., R. Bennartz, A. Merrelli, M. D. Shupe, D. D. Turner, and V. P. Walden, 2018: Precipitation regimes over central Greenand inferred from 5 years of ICECAPS observations. Atmos. Chem. Phys., 18, 4715-4735, doi:10.5194/acp-18-4715-2018. *Miller, N. B., M. D. Shupe, J. T. M. Lenaerts, J. E. Kay, G. de Boer, and R. Bennartz, 2018: Process-based model evaluation using surface energy budget observations in central Greenland. J. Geophys. Res., 123, 4777-4796, doi:10.1029/2017JD027377. *Gallagher, M. R., M. D. Shupe, N. B. Miller, 2018: Relationships between atmospheric circulation, temperature, clouds, and radiation at Summit Station, Greenland with self-organizing maps. J. Climate, 31, 8895-8915, doi:10.1175/JCLI-D-17-0893.1. Lacour, A., H. Chepfer, N.B. Miller, M. D. Shupe, V. Noel, X. Fettweis, H. Gallee, J. E. Kay, R. Guzman, and J. Cole, 2018: How well are clouds simulated over Greenland in CMIP5 models? Consequences for the surface cloud radiative effect over the ice sheet. J. Climate, in press. 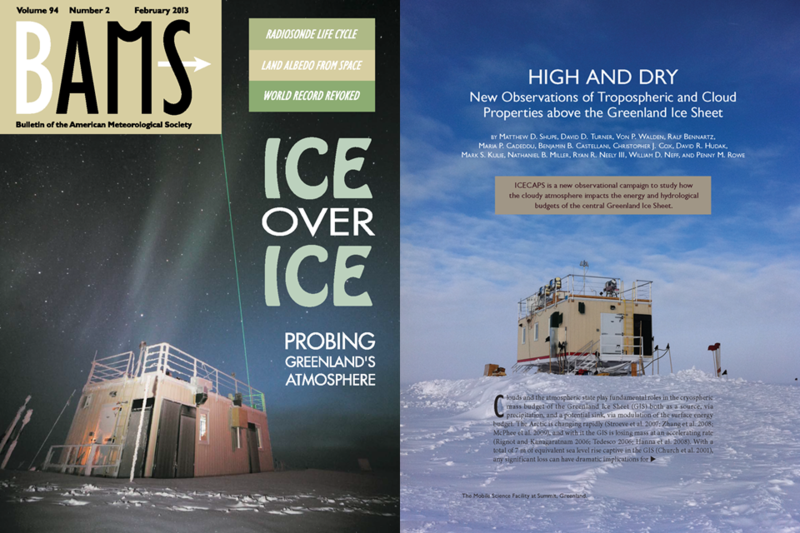 *Stillwell, R. A., R. R. Neely III, J. P. Thayer, V. P. Walden, M. D. Shupe, and N. B. Miller, 2018: Radiative influence of horizontally oriented ice crystals over Summit, Greenland. Geophys. Res. Lett., under revision. Bennartz, R., F. Fell, C. Pettersen, M. D. Shupe, D. Schuettemeyer, 2018: Spatial and temporal variability of snowfall over Greenland from CloudSat observations. Atmos. Chem. Phys., submitted. *Gallagher, M. R., H. Chepfer, M. D. Shupe, and R. Guzman, 2018: Warming extremes across Greenland influenced by clouds. Nature Communications, submitted. Cox, C. J., D. C. Noone, M. Berkelhammer, M. D. Shupe, W. D. Neff, N. B. Miller, V. P. Walden, and K. Steffen, 2018: Super-cooled liquid fogs over the central Greenland ice sheet. Atmos. Chem. Phys., under review. ICECAPS: New observations of clouds, atmosphere, and precipitation at Summit, Greenland. New Cloud Observations at Summit, Greenland: Expanding the IASOA Network.